Another Saturday and another Book Blogger Hop (hosted by Billy @ Coffee Addicted Writer). This week’s question comes from Elizabeth @ Silver’s Reviews. How do you organize your books for review? Does it work for you or have you had to change it? This year I’m keeping track of my reading in a completely different way. In the past, I’d just used Goodreads to track what I read and to post links to the blog posts I write here. This year I decided I wanted more data about my reading habits, so I’m using a Google Spreadsheet. This is also where I keep track of books I’ve read and still want to write a Sticky Note Review for. I’m big on color coding, so books color coded with yellow haven’t been reviewed yet. Books coded in white have been reviewed, and books coded in blue are the ones I’m currently reading. I also keep track of everything in Evernote. My entire life is in Evernote. 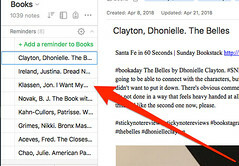 So I use Evernote Reminders to separate out the books that I still want to write reviews for. Often I’ll write those reviews in Evernote and then copy them over to the photo in Instagram after I take it. Because Evernote is on my computer and it’s easier to type on a full keyboard than the small phone one, this also works out well for me. How do you keep track of the books you need/want to review? Leave it in the comments and I’ll see you there soon. Until then, happy reading and don’t forget to be awesome. You are so organized! I love the color coding. Thanks. I figured it was easier than scrolling all the way to the end and seeing which columns had links pasted into them. I tried EVERNOTE and couldn’t get into it. I may have to try again. Nice to see you on the HOP…hope you can join in every week. I’ve been using Evernote for about 9 years now. It’s changed a lot since then. Oh, wow, you put a lot of time and effort into tracking your books! Goodreads is nice, but sometimes, you just want more, or something you have more control of! Thanks for stopping by! Happy reading! It actually doesn’t take that much time. The thing that takes the most effort is making sure I have publisher and imprint. Sometimes that requires running an internet search. I think it’s interesting information to have as I make sure that I’m diversifying my reading habits. Sounds like you’ve got things together. Maybe one day I’ll learn how to organize things. Have a great week. I work with middle schoolers. I had to learn to organize them, so organizing myself became super easy. The colour coding spreadsheet idea is very smart – I definitely will have to try and use it eventually. I currently also use Evernote! I have a list of requested books to read and review so that I know if there are any specific deadlines to meet, but, apart from that, I read what I want when I want. I like being able to be flexible with my reading, but I also like being able to document my reviews and books that I’ve enjoyed, so I’m perhaps thinking of starting a book/reading journal or something? I’m note sure yet. Wow! You seem so organized! Thanks for the suggestions I definitely need to implement them into how I document my reading. Thanks for stopping by my BBH! I love the sound of a Google Spreadsheet to keep track of details that might not be readily available on Goodreads. I have a blogging planner that I use to keep track of books and blog posts. I like having something physical in front of me that I can use to schedule posts. Also, I may or not be a big fan of pens and washi tape.